If you have a new car on your holiday wish list, you are not alone. Automakers want you to consider the newest offerings during the holiday season. While you may not see the commercials yet, they will be coming, and prospective new car owners will have plenty to choose from. 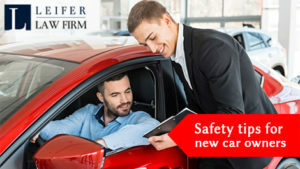 With that, we offer the following tips for car owners so that they can avoid accidents and other issues that come with a new vehicle. Drive for the car’s purpose – Simply put, you should not drive a minivan like it is a sports car, no matter how much the sales person touts the vehicle’s torque and horsepower. So understanding your car’s limits is helpful in staying safe. Understand your car’s braking systems – At the same time, knowing how your car will react in emergency situations is just as important as knowing its internal features. Yes, it is not necessary to know how your car’s stopping distance stacks up against the competition in its class, but it is helpful to know that you will be able to stop safely in certain situations. Avoid technological distractions – Chances are that you were charmed by the latest technological bells and whistles that will allow you to find directions, control your phone and other media, and even send voice based text messages. However, distracted driving is still a huge problem among today’s drivers, so being able to manage expectations and modules is important. Ultimately, drivers have a duty to use reasonable care while behind the wheel. If you have questions about civil liability in the event a driver fails to use such care and causes an accident, an experienced attorney can help.